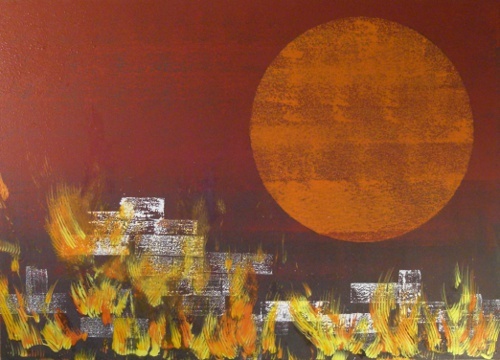 "Olympic Flames 2008: Bloody Sky Over Tibet" Acrylic on mdf-board, 78x108x3,4 cm. For me, doing art is a meditation and an affirmation of life, that lifts me above the problems of everyday. My passion for colors let me take the artist-name "Chromosoph" (greek for "Color-Lover" or "Color-Thinker") I started as a realistic painter. Now I'm a figurative painter but I love the infinite freedom of abstractions... so most of my art is "figurative abstraction"
My artistic influences are based in the art of the early impressionists, the "School of Barbizon". Like the work of those artists, I explore the space between realistic and abstract art - in a rich and diverse stylistic texture. I hope you enjoy looking at my work. Questions? dont hesitate to contact me. All images and content are copyright by the author ©Josef Jobst 2006-2018. July 26th 2011: (again) invitation: "V Beijing International Art Biennale 2012"
May 6th 2010: invitation to the IV Beijing International Art Biennale 2010"
November 21st 2009: shortlisted for the "Art-Inter/National-Award 2010"